Blossom end rot (BER) is most easily identified by a discolored, sunken spot at the blossom end of the fruit. It most commonly occurs with tomatoes but can also appear on squash, melons, zucchini, peppers, and eggplants. 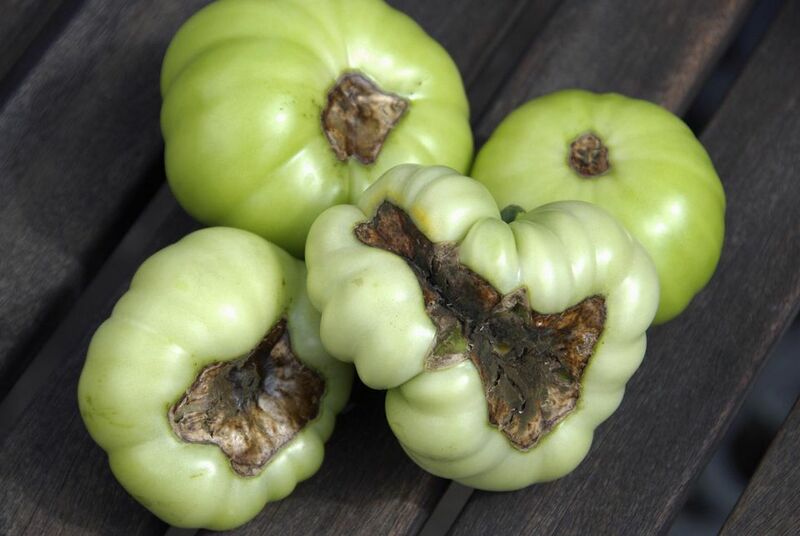 The rot spot starts out small and grows larger and darker as the fruit continues to grow. Generally speaking, blossom end rot causes the fruit to ripen prematurely, resulting in inedible fruit. It is caused by a calcium deficiency and can be managed with proper watering and soil management. A plant suffering from blossom end rot typically show no signs of damage in their leaves or stems. A plant can appear to be quite healthy, yet the fruit will show the tell-tale signs of blossom end rot. Blossom end rot is more common with the first few fruits of the season if you planted in cold soil. It's also common when your garden experiences extremes in soil moisture levels, either too dry or too wet. There really is no life cycle to blossom end rot. Each fruit should be examined for signs of rot. If it is an issue that occurs year after year, you should test the soil to check the calcium level. If improper calcium levels are not indicated and there are no obvious obstacles to growing tomatoes in the area, look to your watering practices as the likely cause. The calcium deficiency that causes blossom end rot may result from low calcium levels in the soil, but more often it is the result of erratic watering. When the plant is allowed to get too dry, or it is given too much water over a period of time, its ability to absorb calcium from the soil is diminished. Blossom end rot can also result when a gardener is too zealous in fertilizing. Too much nitrogen in the soil can cause fruit to grow so rapidly that it cannot uptake calcium fast enough, resulting in blossom end rot. If your soil is low in calcium (as determined by a soil test), the easiest solution is to add lime several times per year, as needed, based on your soil test results. A common, and erroneous, treatment for blossom end rot is to spray a calcium solution onto the leaves, stems, and fruit. This typically does little for the plant because calcium is primarily absorbed from the soil. If calcium deficiency in the soil truly is the problem, then soil amendment with lime or bone meal is the best solution. Pay closer attention to watering. If blossom end rot has been an issue, try to make sure that your soil isn't allowed to dry out. The best defense against blossom end rot is a nice, consistent soil moisture level. Add mulch. By adding a 3-inch layer of organic mulch, you can help maintain adequate soil moisture levels, even during dry spells. It is best to add the mulch after your soil has warmed in the spring; adding it too early can result in your soil staying cold longer than it should. Plant wisely: Plant susceptible crops (including tomatoes, melons, squash, peppers, and eggplants) in well-draining, deep soil that has been amended with compost or well-rotted manure. Soil amended with plenty of organic matter will retain moisture better and supply plenty of nutrition (including calcium) to your plants. Why Do My Tomatoes Turn Black on the Bottom?